The plant ranges from 1-3 feet in height. One or two stems with three leaves which fork off from a single stalk. A green or purple-stripped bloom in the shape of a cup with a flap over the top (called a spathe) appears at the base of the fork. 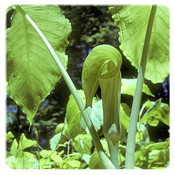 The erect, cylindrical spadix, with its minute flowers, are enclosed inside this “pulpit.” The spathe eventually withers and exposes the fleshy, scarlet berries. It earned its name because the flowers inside the spathe look like a minister’s head sticking up from a pulpit. Mountain children played pranks on unsuspecting victims by washing off the round bulb-shaped roots and offering a bite of Indian Turnips. After one bite from this plant, with fire in their mouths and tears in their eyes, the victims ran screaming for water. When washed, peeled and boiled, the roots are quite edible with the flavor and consistency of turnips. Early Americans also used this plant to relieve headaches or respiratory problems. These native perennials are found in low woods and bogs. April-May.